Dublin City Council are seeking consultants to look at the potential of a “quietway” or “neighborhood greenway” cycling and walking route on residential streets from Kimmage to Donnybrook. The route would also link Terenure, Rathgar / Rathmines, and the northern edge of Milltown. The draft proposals are the result of work by Cllr Paddy Smyth (FG), who represents the Rathgar/Rathmines area. International examples of such routes (see below) usually include different levels of blocking motorists from using the streets as through routes, including using physical traffic “diverters” and having alternating one-way streets, where cycling is allowed two-ways along the whole route but motosist can only use short sections before they hit a no entry / one-way street sign. The US, UK and Dutch equivalents of the route all use 30km/h or 20 mph speed limits but a Dublin City Council report on the issue does not mention speeds at all. The proposed route is all on residential streets with a 50km/h limit and some campaigners say that the city council is dragging their feet on reducing limits on residential streets. The Dublin City Council report includes suggested proposed interventions of filtered permeability (access only for cycling and walking) at some junctions using bollards and openings in current walls, and, at larger junctions, shared walking and cycling toucan traffic light crossings and bicycle crossings. It says that the consultants should also give other options and suggestions. Overall, the consultants are being asked to evaluate the feasibility of the suggested route or an alternative route and make recommendations; identify and recommend any low cost interventions; prepare a cost estimate for each identified; recommend potential phasing; and to address any safety and traffic impacts of the project. The council says that the feasibility study should be finished by May 12, 2016, and companies wishing to tended for the work should submit their bids by March 14. IMAGE: Current suggested route in blue, with Cllr Smyth’s original suggested route shown in red — Click map for link to larger version on Google Maps. Cllr Smyth told IrishCycle.com this weekend that the draft route (shown in blue above) differs from his orignal route (shown in red) to more closely follow the feeder routes in the Greater Dublin Area cycle network, and to make the route more workable, including avoiding his origanl suggestion of using Miltown Park as this would have required a CPO, which would prove too expesive at this stage. BikePortland.org reported last year that speeding is common on the Portland routes, which have a 20mph (30km/h) speed limit, and that that some key connections in their netwok of routes have very heavy traffic voulmes. 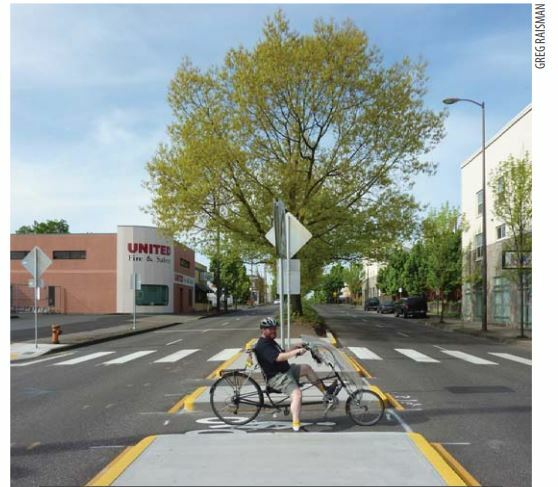 The city of Portland is doing on-going work to install “diverters” at junctions which physically blocks drivers from using the network as through routes. 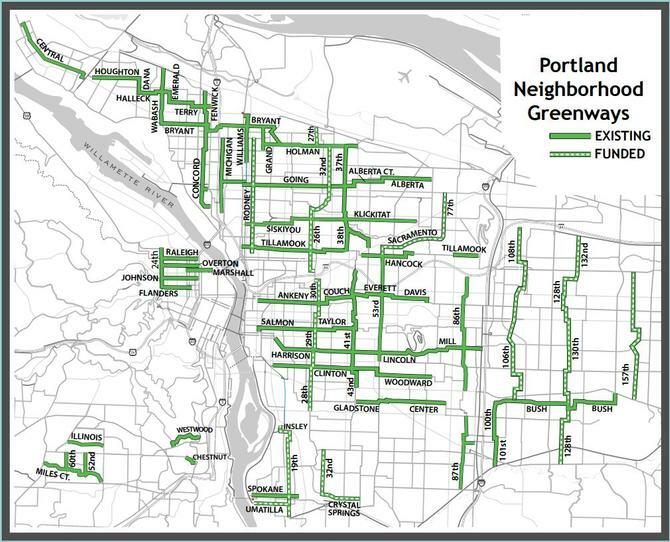 The city of Portland has also directed police to enforce speed limits and turning restrictions on the route — a power Dublin City Council lacks. LONDON: The “quietways” name comes from London, but the mayor’s aims of quiet and safe streets for cycling is under question there as campaigners have criticised the quality of the routes . 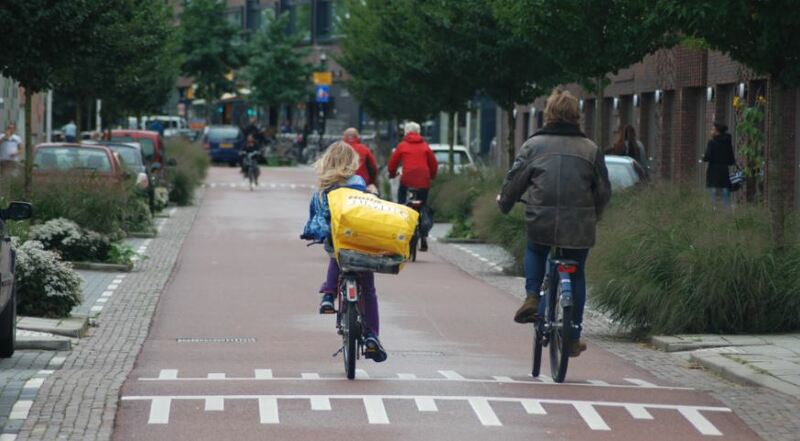 THE NETHERLANDS: Dutch residential streets are generally cycling friendly, but the closest equivalent route type to the UK and US examples are “bicycle streets”, these are usually linked to segregated cycle routes on connecting main routes. Dutch bicycle streets also have their issues, Dutch transport planners told this website last year that the routes have to be carefully designed and they encounter speeding problems when sections of the routes are long and straight without diverting motor traffic. But overall, the country’s high bicycle use, full-length street redesigns and the motoring restrictions on the routes likely makes bicycle streets the more successful of the international examples. In the short-term, Dublin won’t have the funding for Dutch-like full-length street redesigns but lessons can be learnt from the Netherlands straight away, including alternating one-way streets for motorists while providing two-way access for cycling. Great news. I hope it goes ahead with little delay. The more we have of these types of local feeder schemes, the more we’ll encourage people out on their bikes and away from cars. The Green Path, “Den Grønne Sti”, in Copenhagen is a great example. This is the stupid idea coming from someone who does not live or properly represent the people in the area. This idiot wants to bring cyclists across major roads and through narrow streets. The link between Harolds Cross Road and Kimmage Road Lower ( a very busy major link road from Templeogue to City Centre) cuts through an area that sees very little cyclists, about 6 journeys per day, and only local pedestrian footfall. When Cllr Smyth got the bollards on Corrib Road open for cyclists he and the City Council failed to have the proper road safety signage and yellow road marking installed. The only thing this opening has achieved is to provide pizza delivery couriers an easy path and this has caused a few “near misses”. Before any further work is carried out on this project consultation with the local residents must be carried out. Cycling through narrow streets….. What’s wrong with cycling through narrow streets? Much better than driving through narrow streets, I would have thought. Are you against walking along narrow streets too? Regarding your point on bollards – are you against providing for segregation? Your point about pizza deliveries comes down to one of education & enforcement by Gardai, not segregation. And the Gardai certainly need to step up their game in relation to enforcement on a wide-range of traffic matters – so we agree on that. I’m not sure what your overall point is. Are you against more people cycling, or just perceived outside interference? As Citizen Wolf has dealt with many of your issues I will skip to the last one on consultation. I have already personally called of 150 of the 204 houses on Corrib Road to provide information about the project and get feedback. I will get to the rest and those of the surrounding roads in the next couple of weeks. I will repeat this exercise before the end of the summer. I will also arrange a meeting with the Residents’ Association to ensure all stakeholders have been consulted. I hope this goes some way to ameliorating your concerns and I look forward to your ongoing input. It is welcome news to hear the good councillor will be contacting the residents association to discuss the not insignificant impact of this proposal. The lack of any communication until the proposal has reached this stage shows a lack of any concern for residents along the route. Calling at 11 am on a work day to 150 houses, after a plan is this far into development is not generally considered “consultation ” but we look forward to your presentation of the proposal. If Citizen Wolf was conversant with the area involved he would know that these narrow streets are the access roads and putting cycle lanes in would prevent motorised access to the residents. Walking in these areas is not a problem as there are pathways which are used. This is not a segregation issue as the bollards were only erected when the residents asked for speed ramps to be installed on Derravaragh Road after a few near accidents caused by drivers using this road to avoid the congestion on Kimmage Road Lower at peak traffic times. This system brought the traffic travelling from Harolds Cross Road to Kimmage Road Lower through Neagh Road where there is a childrens playground, what a bright idea!! This new plan for cycle lanes now has to cross 2 very busy roads in this area, do you really think that this is a safe idea? As I have cycled in this area for 30 years I think I have a good idea of the problems involved in this plan. Both Cllr Paddy Smyth and the City Council need to look at the planned route from the Harolds Cross Road to Poddle Park to see the mistakes they have made regarding the terrain and junctions. 4. The disruption to residents in the areas where they are being installed. With regard to Cllr Smyths visit to residents on Corrib Road please remember that there are other roads which connect to this road, and other roads involved in this plan that may be affected due to one-way systems , no entry etc. Before this idea was put before the City Council and put out to tender consultation should have taken place with the various resident associations instead of waiting until it had reached such an advanced stage. Ok I may be missing something if these are supposed to be back street routes using quiet residential roads then why would there be any need for cycle lanes on the roads themselves? Surely what is needed is crossing points and connections to join them? I think we need to have a public meeting with all resident and relevant residence associations and cllr Paddy Smith to explain how this is a good idea for the area . People have not been informed have checked with neighbours in regards to this. It’s almost like people live in a fantasy world where road traffic isn’t a problem, unless that road traffic happens to consist of bikes. Bikes = non-polluting, not noisy, zero deaths, less road maintenance, increased health of society, reduced overall health costs, increased freedom for kids, disabled and elderly. But yea, lets make sure every obstacle is put in the way of building cycle infrastructure. Thank you Citizen Wolf but please don’t paint an obviously biased picture that cycling as the silver bullet to Dublin’s traffic woes. I regularly walk and cycle from Terenure to Donnybrook and I find the current road network to be efficient. I know other cyclists who make the journey and never has it been said that a route through housing estate after housing estate is something they wish for. We all use this city, not just for cycling in but actually living in. Cyclists need to get over this sense of self entitlement. People actually live there and you are effecting their lives not necessarily in a positive way. There are many issues with this plan but two that stand out are (a) The improper consultation (b) the waste of money. We have real issues in this country; health service, education, utilities, people in poverty. Please cop on. I’m happy to publish comments from both sides of the arguments, but I’d ask people to please keep it civil. @ Derek… Cycling might not be a silver bullet to anything but if safe and attractive cycling is provided for it’s not for “cyclists” it’s for the many people who would cycle if conditions were better and that would have positive effects in relation to traffic, mental, general health, and the economy. Transport funding is not spent on health, education or housing. Are you arguing just against spending on cycling or are you also against all other roads spending until the problems you list are sorted out? You may not find anything wrong with the current conditions for cycling but most people do, including people who would cycle if conditions were better and people who already cycle. @Trish I’m not the one proposing the route but I’d be interested to know why you would be against opening a gap in the wall to allow people to walk and cycle in a more direct way away from busy roads? By the way, going by the standard design of these type of routes, I don’t think anybody is suggesting a cycle path on your road, it would just be a gap in the existing wall. The idea of these types of routes is minimum changes: the likes of gaps in walls, traffic calming, safer crossing of larger roads etc — usually things residents are looking for or end up welcoming. So much to unpack with much of what you wrote Derek. But just in reference to the above paragraph. Yes, we are both in agreement – a city is for living in. At the moment our city is in the grip of car-culture. Unfortunately the vast majority don’t actually see it because it’s all they know. If you were to spend some time in places like the Netherlands or Copenhagen you’d see how cities can be transformed into places for living by not subverting all aspects of our lives to cars. I never said cycling is a silver bullet – but it most definitely does have a large and beneficial role to play in making our cities more livable (something which you’ve stated you want). As I mentioned above, cycling can provide for transport of the majority of trips for the majority of people taken in an urban environment. And just to hammer that home I’ll reiterate – the majority of trips taken by the majority of people. How is this not something to be aspired to? And all this done without harmful pollution (thousands die in Ireland every year from vehicle pollution – thousands! ), no noise (a major source of stress to urban dwellers), low maintenance of infrastructure (money saved to be spend on those other important issues you mentioned), it provides a net monetary gain to society (more money saved for those important issues you spoke of), it provides significant health benefits to society (yet more money saved to be spend on those other important issues you spoke of), by switching to bikes and away from cars it frees up space (cars are woefully space-inefficient in urban areas, by switching to bikes and away from cars it makes public space MUCH safer for all ages (kids, old people, disabled people) and thus really does make our cities more livable. BTW, what is this sense of entitlement you speak of? Please explain this with examples. All I want is for my city to be safe, have clean air, have the population more healthy, have the population suffer less from chronic expensive diseases such as obesity and diabetes, have freedom and safe spaces for kids and disabled and old people, and so on. And this is somehow entitlement? What am I to cop on about exactly? When someone doesn’t have your point of view, do you always reason with them by telling them to cop on? I prefer sound argument myself. Present some. 1. There will be no cycle lanes. The QuietWay would use the existing road layout. No changes to parking either. 2. The sole purpose of this project is to provide children with a safe route to and from school away from busy roads. 3. The route would be unlikely to attract adult commuter cyclists as, due to the circuitous nature of the route, the surrounding main roads would be far quicker in all directions. 4. The recent door to door campaign is just the first part of extensive consultation with residents which will also include public meetings. No concrete plans will be made until this is completed. 5. Nothing will happen without the support of residents along the route. 6. If this amenity is not wanted by the majority of residents along the route, another route will be chosen by the design team. Many thanks for clarifying Cllr – as lots of questions from neighbours apposed to knocking of wall through to cul-de-sac etc. If your neighbours are concerned then there would be a view that having people on bicycles moving through an area can increase “social security”. It makes the place less attractive for people who want to hang around but don’t want to be seen. I thought this was a great idea when I first heard about it. This kind of initiative is needed to encourage people to cycle short distances instead of driving. If their route is significantly safer, I am certain people will make this choice. I’m a bit surprised by some of the replies above. It’s not entirely clear to me what the concens are. I expect there may be some uncertainty about change, and perhaps a worry that neighbourhoods will see signifiant numbers of aggressive cyclists passing through. In fact, the people who will benefit most are the those living on the route for whom cycling around for short journeys will be realistic option. In addition, rat-runs will be eliminated (or reduced) making the environment significantly more enjoyable. Anyway, I look forward to the public meetings where I can voice my support. From the map above I think you are proposing to include Merton Drive in Ranelagh as part of the route. There are only two ways for the large amount of traffic passing from Dunville Ave to the South section of Ranelagh Villlage and on to Clonskeagh, Donnybrook etc. One is via Ashfield Road (which has no traffic lights at the Ranelagh junction) and the other is via Cullenswood Gardens and Merton Drive (which has traffic lights at the Ranelagh junction). These are not “rat runs”, they are the main routes. Have you considered the impact of the increased traffic onto Ashfield Road if this plan is implemented? Have residents been informed of this plan? Congestion ? Presumably you mean there are too many cars on your road ? Providing school children a shortcut to walk to school would not affect congestion on your road. It would be helpful if you would explain why you think residents would be opposed to allowing people to walk or cycle on this road ? Is there something special about this road ? Awaiting feasibility report from the Engineers who will model traffic flows to the surrounding streets. This should be available by the end of next week. Will be looking for feedback from residents once we have a preferred route confirmed by same. In an ideal world the solution would be use the perimeter of Gonzaga/Miltown park and use Belmont and Victoria Avenues to get to Herbert Park but the CPO would be prohibitively expensive. will the engineers report be made available on your website? >5. Nothing will happen without the support of residents along the route. >6. If this amenity is not wanted by the majority of residents along the route, another route will be chosen by the design team. Will the support of residents from streets adjacent to but not on the actual route that are affected by the change in traffic flow also be required before the route is chosen? As the oldest and longest resident of Ashdale Gardens I am deeply disturbed by the proposal to create a passageway for pedestrian and cycle traffic through the wall adjoining Corrib Road. Our road is quiet and does not currently have any through traffic, pedestrian or otherwise. Putting a hole in the wall would open up the road to a host of new traffic, and would fundamentally change the extremely quiet nature of the road. Our small cul-de-sac (only 14 houses) is currently a dead end and therefore inherently safe for pedestrians, especially small children and slow-moving adults (like myself). The road is completely unsuitable for through-cycle traffic, which inevitably would increase the risk of accidents. I myself recently only narrowly escaped serious injury from careless and fast-moving cyclists (on the footpath) close to my home. Apart from the above concerns, I find it completely bizarre that a route over the footpath at Corrib Road and through the Ashdale Gardens wall would be even considered – given the simple alternative of using Mount Talent Avenue which would not require any new openings and is already open to unrestricted use by cyclists. Why create through-traffic in an existing quiet space just for the sake of it? Regarding consultation I sincerely hope that this is not just empty words and that both written and face-to-face consultation will happen with every resident on Ashdale Gardens. From my own conversations with my neighbours I am confident that every one of them shares my own concerns. I am encouraged to read Councillor Smyth’s assurance that nothing will happen without “the support of residents along the route”. As it stands I will certainly not be supporting any move that changes the status of Ashdale Gardens as a “Cul-de-sac”. Right now the majority of residents along this part of the proposed route would most certainly object to any such move. Finally I will be most interested to understand what consultations have taken place with the owner of the wall itself regarding the proposals to put a passageway through it. Land records show this wall as the historical boundary of Ashdale Gardens and Ashfield House. On this basis I expect that any changes proposed to the wall would require the consent of the residents of Ashdale Gardens. I look forward to welcoming Councillor Smyth to Ashdale Gardens in due course for the consultations. Not sure why being the oldest resident is a cause for stating. If the oldest resident just so happened to support the route, should this have any bearing on the outcome? Absolutely zero consultation from initial stages of this man’s schemes. We live in a democracy Paddy. As a doctor you can prescribe to the individual but when you move to a wider political realm you consult. Disgraceful lack of regard to community stakeholders. As a resident of Corrib road I can say that the first time I heard about these plans was when members of the residents association knocked on my door this evening. From my perspective there has been no consultation. I and my children cycle and walk through and around the area most days of the week and I have no concerns about access or safety. I am baffled as to how a substantial proposal to make changes to the road I live on can get this far without proper consultation. I would at least expect a formal letter from the councilor outing the detail of the proposal. I am opposed to the plans I have seen as I cannot see the benefit and only see disruption being caused to residents who did not ask for this and from speaking to many of my neighbours do not support it. @ Philip — what plans were outlined to you? @ Susan — just to note, the plan is still at a very initial stage. Philip, As a resident of Ashdale Gardens we were led to believe that Paddy Smyth had explained his plans and had positive supporting signatures of agreement from Corrib Road..
We are now aware that the neighbourhoods of Ashdale are not anti cycling but are very aware of cycling and pedestrian safety in the environs… What comes first???? The existing situation in the area suits everyone.. Why no leave well enough alone. However, We do need road surface repair on Ashdale, that DCC dismisses as unaffordable until the next budget…… for the last 20 odd years. I have no doubt that this consultation with residents will occur in due time. No plans have been outlined to me and that is a large part of the issue. I have gathered what I know about this from the residents association, this article and another article on the Journal. The route will go down Corrib road and must entail some modification. The road is already quite narrow so to make any change giving cyclists and or pedestrians more priority (which is not needed in my opinion) would mean changes to on street parking and two way access for motorists. This is not in the interests of residents on the road. I await the councilor sending letters to residents outlining exact plans for my road and setting up a meeting with the residents association so he can get peoples feedback. This needs to happen urgently. Susan,Philip – Allow me to address your concerns on consultation. I called to each door on Corrib Road earlier in the summer to speak to residents and hand delivered an outline of the proposal. This process would have been repeated, but the Corrib Road resident association requested that I meet them before continuing same. Following a recent meeting of the Resident’s Assoc, I was informed that this meeting would not go ahead as it would have been deemed unfair to the other local Councillors and that they would prefer me to organise a public meeting instead. I would hope to have this meeting in October/November. Will let you know as soon as date/venue nailed down. I live on Corrib Road and Cllr Paddy Smyth did not call to my house or leave any information. I live on Corrib Road and Cllr Paddy Smith DID call to my house and gave us lots of information. It sounds like the Corrib Road resident association needs to do some work on the communications end. I live on Corrib Road and Councillor Smith did not knock at my door, or if he did I was not at home. He left no information in my letter box. I heard about it from the residents association. I was not consulted about the bollards going up on Corrib Road and I never knew they had had a gap put in them until a motor cyclist came flying through and broke down my neighbours garden wall and damaged two neighbours cars, one was brand new and was a right off. Apparently the motorcyclist was not insured. There is no signage telling the cyclist and motorbikes to yield to traffic when going through the gap in the bollards so there is a risk they may go straight through onto oncoming traffic. Has the Councillor considered the problems created by such gaps in relation to crime and has he consulted the Gardai? When we get broken into the perpetrators can cycle or run away through the bollards and we can’t follow in our cars, and neither can the Gardai. I have not seen this proposal on public display, nor did I find it in the City Development Plan or any NTA plans. It is not clear to me what is involved in this current greenway proposal. A greenway is defined in the NTA Transport Strategy for the GDA 2016-2013 as “Greenways – fully segregated off-road routes along canals, rivers and disused railway lines”. This does not apply to Corrib Road. Section 1.9 of the National Cycle Manual clearly states that “Sustainable urban environments are for people who are living in, working in, moving through or just visiting the area. Pedestrians are the most vulnerable of all road users, as they include children, blind and disabled people and the elderly, as well as able bodied people. Urban design of town and city centres should aim for the optimum pedestrian Quality of Service consistent with the overall traffic plan. Shared facilities between pedestrians and cyclists generally result in reduced Quality of Service for both modes and should not be considered as a first option”. In view of the above can I safely assume that the proposed cycle to school route will not involve the shared use of pavements? Where can I view this plan and when and where do we lodge our comments? Paddy, I’m not sure if you and this Citizen Wolf troll are the same person? What an awful agent to be shadowing every word you say and vice versa. Your souless antics and knee jerk retorts against people with extremely valid concerns of your daft poorly defined proposal will not deter an well educated community. See you at the meeting. Are you going to arrive in shorts again poorly prepared for this one?? There are adequate facilities already in place for cyclists, without making a speedway for unlicensed uninsured cyclists. The ruination of these suburbs is unnecessary, this is a bad idea and very upsetting for people on this route. Not sure why you’ve resorted to name-calling. Is there anything in which I’ve said that’s unreasonable? Btw, I’ve never met Cllr Smyth. @Cian – is name-calling allowed, because if so, I’ll happily get into it with Adrian who’s provided no input other than to call me a troll. @Adrian Name calling goes against the comments policy and I’d ask you to please keep your comments relating to the topic and not the people — ie play the man and not the ball. It’s a pity that (some?) Ashdale residents don’t want an opening in the wall at the end of the road – if there were an opening for cyclists to come through there, and another leading through from Cedar Court to Shanid Road, this would allow the children from that quarter who go to school in Scoil Mológa and Harold’s Cross National School to cycle safely to school, rather than being driven or walking the long way around that necessitates a 1.2 kilometre journey for what should be a couple of hundred metres. One possible negative is that cycle routes tend to gentrify the neighbourhoods they pass through (https://www.theguardian.com/cities/2016/oct/05/blame-bike-cycling-contribute-city-gentrification). What rubbish. I live along the route and fully support the quiet way. Have you even read the proposal ? Rather than making uninformed accusations and repeating gossip, If people would actually look at the plan and attend the public meeting/s so that they have accurate information about what it involves. There are very few and very minor infrastructural changes involved. Lose the histrionics, engage in the consultation. I believe it’s a positive proposal for a safer and more pleasant environment for everyone on the route, whether you walk, cycle or drive. I find it extremely disappointing that this proposal has resurfaced yet again, having been roundly rejected last year by a large number of residents along the previous proposed route (including ALL the residents of Ashdale Gardens). Predictably the proposal this time is every bit as ill-founded as last time. This time I note that the route brings cyclists down Ashdale Road. As anyone familiar with Ashdale Road will know, with cars parked on both sides of the road there is barely enough room for a single vehicle to pass. If two cars should meet on this road it’s necessary for one of them to find a place to pull over in order to allow the other car to pass. Visibility is extremely poor for pedestrians attempting to cross the road. It is equally difficult for cars or cyclists to see pedestrians attempting to cross. This is hardly a safe route along which to encourage cycling with young children. Notwithstanding the congestion and poor visibility, it is quite extraordinary that Dr Smyth has managed to secure Dublin City Council funding for the Feasibility Study behind this proposal. The so-called “Feasibility Study” is nothing more than a thinly disguised justification for a pre-determined outcome. As far as I can see this proposal does not feature in either the National Transport Authority’s Strategic Plan or Dublin City Council’s own strategic transport plan. Meanwhile there are several other legitimate proposals for development of cycle-ways which are specifically included in the strategic plans which are not being progressed at all. Where is the basis for this study in the first place. How is it that Dublin City Council seems prepared to spend public money on this rogue plan with no strategic backing. I think this is the third (if not the fourth) attempt by Dr Smyth to find a route that is not rejected by affected residents. Concerned residents can take comfort from Dr Smyth’s previous assurances that nothing will happen without “the support of residents along the route”. I hope that sufficient numbers of residents will make their views known to ensure this waste of public money is finally deposited in the waste bin rather than perpetually recycled and hoisted onto yet another unsuspecting pool of residents. Yes Richard I have read the ridiculous report, it gives examples of very wide roads which don’t exist in the area, it does not report on consultation , it has failed to find any shortcomings of plan. It implies that the plan is feasible, yet the latest flier in my door says route is now going down Terenure Park, so it looks like the Corrib Road route wasn’t feasible after all. So it now looks like you are playing a game of pick and choose different parts of the report that suit you. I live on Corrib Road with two children under seven who I try to encourage to cycle to school, though reading these comments I wonder why I bother. Have any of you people tried cycling on Kimmage Road Lower or Mount Tallant or any of these other areas at peak times? Every road is ideal for cycling when it is quiet and there is no traffic. Try doing it in the morning or the evenings at rush hour. Now try doing it again, this time with two children. Do people not realise that for every extra bicycle on these roads, there is one less car?? The choice for me isn’t between cycling or staying at home. The choice is between cycling or driving. If you’re not happy with me cycling past your house at 8mph, then why are you happy with me driving past at 30mph? Does my car really make your area safer?? I went to the meeting tonight, the overwhelming majority of residents on Paddy’s proposed route were against the plan. I think that that is the end of it.